Whisk yourself away to the delightfully scenic surroundings of the Enchanted Garden II slot, the sequel to the extremely popular Enchanted Garden slot powered by RTG. The Enchanted Garden II slot offers 25 variable paylines on 5-reels and can be played on all platforms. 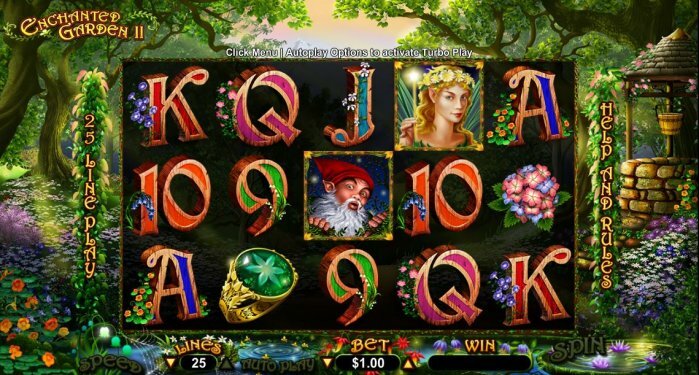 Set in a beautiful atmosphere and boasting magnificent effects and sounds, this slot shows the progression of slot technology in the last 10 years since the original Enchanted Garden slot release. Enchanted Garden II chas 2 features, the Firefly Feature and the Fairy Queen Feature – both providing thrilling action for slot fans. In the Firefly Feature players have the chance to win 7 free games with all prizes tripled, and if 3 or more Firefly symbols appear an additional 3 free games are awarded. To trigger this exciting feature reveal a Garden symbol on reel 1 and a Fairy Princess on reel 5. On the Fairy Queen Feature, 10 free games are awarded and Wilds appear on reels 2, 3, 4 and 5 and all prizes are tripled again during free games.